According to the World Health Organisation a Stroke is defined as an accident to the brain with "rapidly developing clinical signs of focal or global disturbance to cerebral function, with symptoms lasting 24 hours or longer, or leading to death, with no apparent cause other than of vascular origin and includes cerebral infarction, intracerebral hemorrhage, and subarachnoid hemorrhage". According to the World Health Organization (WHO), 15 million people suffer stroke worldwide each year. Of these, 5 million die and another 5 million are left permanently disabled. The 2010 Global Burden of Disease Study suggested Stroke is the second leading cause of death globally and the third leading cause of premature death and disability as measured in Disability Adjusted Life Years (DALY). Cerebrovascular disease is the largest neurologic contributor and accounts for 4.1% of total global DALY. Stroke kills more than 49,000 people each year in the UK, nearly 1 in 10. In 2010 stroke was the fourth largest cause of death in the UK after cancer, heart disease and respiratory disease. At the base of the brain, the carotid and vertebrobasilar arteries form a circle of communicating arteries known as the Circle of Willis. From this circle, other arteries—the anterior cerebral artery (ACA), the middle cerebral artery (MCA) and posterior cerebral artery (PCA)—arise and travel to all parts of the brain. The image below clearly shows the function areas of the cerebral cortex that can be affected following insufficiency of the blood supply. A stroke occurs when there is interruption of the blood supply to a particular area of the brain, ultimately leading to cell injury and cell death. Ischaemic strokes are the most common, accounting for up to 80% of strokes, and occur when there is an occlusion of a blood vessel impairing the flow of blood to the brain. Thrombotic - Where a blood clot forms in a main brain artery or within the small blood vessels deep inside the brain. The clot usually forms around atherosclerotic plaques. Embolic - A blood clot, air bubble or fat globule forms within a blood vessel elsewhere in the body and is carried to the brain. Systemic Hypoprofusion - A general decrease in blood supply, eg. in shock. Haemorrhagic Strokes occur when a blood vessel in the brain ruptures and bleeds. Intracerebral Haemorrhagic Stroke — there is bleeding from a blood vessel within the brain. High blood pressure is the main cause of intracerebral haemorrhagic stroke. Subarachnoid Haemorrhagic Stroke — there is bleeding from a blood vessel between the surface of the brain and the arachnoid tissues that cover the brain. Nb. Some experts do not classify Subarachnoid Haemorrhage as Stroke because subarachnoid haemorrhages present differently from Ischaemic Strokes and Intracerebral Haemorrhagic Strokes. Left face and arm upper-motor weakness due to damage to motor cortex. Left hemineglect (variable) due to damage to non-dominant association areas. There may also be left face and arm cortical type sensory loss if the infarct involves the sensory cortex. Right pure upper-motor hemiparesis due to damage to the basal ganglia (globus pallidus and striatum) and the genu of the internal capsule on the left side. 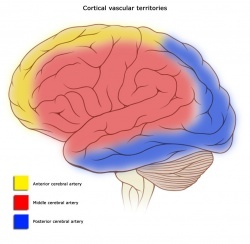 Larger infarcts extending to the cortex may produce cortical deficits such as aphasia. Left pure upper-motor hemiparesis due to damage to the basal ganglia (globus pallidus and striatum) and the genu of the internal capsule on the right side. 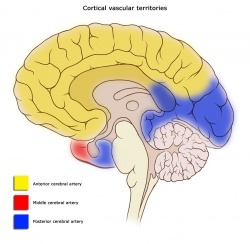 Larger infarcts extending to the cortex may produce cortical deficits such aphasia. Left homonymous hemianopia due to damage to right visual cortex in the occipital lobe. Larger infarcts involving the internal capsule and thalamus may cause left hemisensory loss and left hemiparesis due to disruption of the ascending and descending information passing through these structures. Right leg upper-motor neuron weakness due to damage to motor cortex and right leg cortical sensory loss due to damage to sensory cortex. Grasp reflex, frontal lobe behavioral abnormalities, and transcortical aphasia can also be seen if the prefrontal cortex and supplemental motor areas are involved. Left leg upper-motor neuron weakness due to damage to motor cortex and left leg cortical type sensory loss due to damage to sensory cortex. 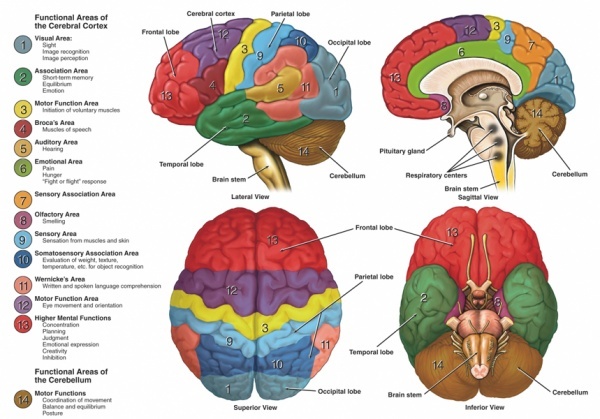 Grasp reflex, frontal lobe behavioural abnormalities and left hemineglect can also be seen if the prefrontal cortex and non-dominant association cortex are involved. Patients presenting with Glasgow Coma Scale scores of 8 or less or rapidly decreasing Glasgow Coma Scale scores, require emergent airway control via intubation. A recent study has showed gait improvement with high-intensity interval training and moderate-intensity continious training in ambualatory chronic stroke patients. Accoridng to the post-stroke guidelines, moderate-intensity, continuous aerobic training (MCT) to improve aerobic capacity and mobility after stroke. High-intensity interval training (HIT) has been shown to be more effective than MCT among healthy adults and people with heart disease. Physiotherapists should be involved early, and should make their own assessment of how much they can work with a patient. Early mobilisation is associated with better outcomes - even after taking account of the potential confounding influence of disease severity. If rehabilitation is to take place on a different ward from acute care, the care received should be made as seamless as possible. Type and intensity of therapy should be determined by the patient's needs not location. Prevent shoulder pain and if unable to do so, manage should pain effectively. Be selective when choosing compensatory versus remedial intervention methods to treat clients who are predicted to have a low return of motor function and poor functional use of their arm and hand. Provide remedially focused rehabilitation to clients who are predicted to change in arm and hand function. Use measures of known reliability and evidence of validity for treatment planning and outcome prediction. In the upper extremity with severe impairment and/or poor prognosis for recovery (Chedoke McMaster Stroke Assessment (CMSA) of Arm and Hand < Stage 4) treatment should focus on maintaining a comfortable, pain-free, mobile arm and hand. Participate in classes supervised by professional rehabilitation clinicians in institutional or community setting that teach the client and caregiver to perform self range of motion exercises. Engage in motor-learning training including the use of imagery. Strength Training - There is evidence that strength training can improve upper-limb strength and function without increasing tone or pain in individuals with stroke. Canadian Best Practice Recommendations for Stroke Care. Heart and Stroke Foundation and the Canadian Stroke Network,Ottawa, Ontario Canada, 2013 (see also 2010 Canadian Best Practice Recommendations for Stroke Care). Stroke Management. National Stroke Foundation, Australia, 2010. Stroke: Diagnosis and Initial Management of Acute Stroke and Transient Ischaemic Attack. NICE Guidelines, 2008. Stroke Rehabilitation: Long-term Rehabilitation after Stroke. NICE Guidelines, 2014. Clinical Guidelines for Stroke Management A Quick Guide for Physiotherapy. National Stroke Foundation, Australia, 2010. Clinical Practice Guideline for Physical Therapy in Patients with Stroke. Royal Dutch Society for Physical Therapy (KNGF), 2014. Canadian Best Practice Recommendations for Stroke Care: Stroke Rehabilitation. Heart and Stroke Foundation and the Canadian Stroke Network,Ottawa, Ontario Canada, 2013. Hypoglycemia and hyperglycemia need to be identified and treated early in the evaluation. Not only can both produce symptoms that mimic ischemic stroke, but they can also aggravate ongoing neuronal ischaemia. The Evidence-Based Review of Stroke Rehabilitation (EBRSR) is a comprehensive and up-to-date review available examining therapy-based (and also pharmacological) interventions associated with stroke rehabilitation. This presentation, created by Dr. L. Surbala (MPT Neuro), discusses etiology, risk factors, stages of recovery, impairments and recovery from stroke. This presentation, created by Dr. R.D. 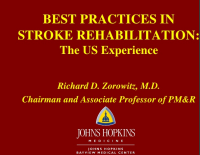 Zorowitz MD, discusses current practices in stroke rehabilitation. This presentation, created by Eusivia Pasi MPT, discusses current practices in stroke rehabilitation. ↑ Global Burden of Stroke. The Atlas of Heart Disease and Stroke. MacKay J, Mensah GA. World Health Organization. ↑ Harwood R, Huwez F, Good D. Stroke Care: A practical manual. New York: Oxford, 2011. ↑ 11.0 11.1 Susan Barreca et al. Management of the Post Stroke Hemiplegic Arm and Hand: Treatment: Recommendations of the 2001 Consensus Panel. Heart and Stroke Foundation of Ontario, 2001. ↑ Harris JE, Eng JJ. Strength training improves upper-limb function in individuals with stroke: a meta-analysis. Stroke. 2010 Jan;41(1):136-40. ↑ Barry JG1, Ross SA, Woehrle J. Therapy incorporating a dynamic wrist-hand orthosis versus manual assistance in chronic stroke: a pilot study. J Neurol Phys Ther. 2012 Mar;36(1):17-24. ↑ Aukje Andringa, Ingrid van de Port, and Jan-Willem Meijer. Long-Term Use of a Static Hand-Wrist Orthosis in Chronic Stroke Patients: A Pilot Study. Stroke Research and Treatment, 2013. ↑ Kwakkel G, Kollen BJ, Krebs HI. Effects of robot-assisted therapy on upper limb recovery after stroke: a systematic review. Neurorehabil Neural Repair. 2008 Mar-Apr;22(2):111-21. Epub 2007 Sep 17.